Panna Cotta: Quick, Easy, and Delicious Dessert! I never tried to make Panna Cotta at home until recently, and now wish I’d made the leap a long time ago! Not the usual gelatin dessert; this dish transports you to fine-dining cuisine. Smooth and creamy but not overly rich; this dish can be eaten with any meal of the day and varied to match your creativity. Herbs, flavorings, & toppings can change this simple dish easily. Sprinkle gelatin over milk in a cold saucepan. Allow to sit for 3-5 minutes to soften gelatin. Stir over medium heat till gelatin dissolves but milk does not boil, about 5 minutes. Add cream, honey, sugar, and salt. Stir till sugar dissolves, 5-7 minutes. Remove from heat and pour into the container of your choice (ramekins, wine glasses, etc) Chill 6 hours. Top with fresh fruit to serve. Pour 1/3 cup almond milk into a small bowl and stir in gelatin. In medium saucepan stir together the cream, remaining almond milk and sugar. Bring to boil over medium heat. Watch carefully not to scorch. Pour gelatin and almond milk into cream mixture and stir until gelatin is dissolved. Add 1/2 tsp almond extract and vanilla extract and cook for 1 minute, stirring constantly. Remove from heat and pour into ramekins (or vessel of your choice). Allow ramekins to cool uncovered. When cool cover with plastic wrap and refrigerate at least 4 hours or overnight. To serve: Mix 1/4 tsp almond extract with chocolate fudge syrup (or your preferred topping) and drizzle over the top of the panna cotta. For a stylish presentation, Cotta may be removed from the ramekin by dipping into hot water briefly and overturned onto plate, then drizzled. Fresh fruit and mint garnish always dresses up the dish for those wishing to make a beautiful presentation. Please give Panna Cotta a try. You will be glad you did. There are many recipes out there with endless variety to match every palate. This Simple Pleasure is easy to make and serve, and nearly healthy! Why not give it a try soon? 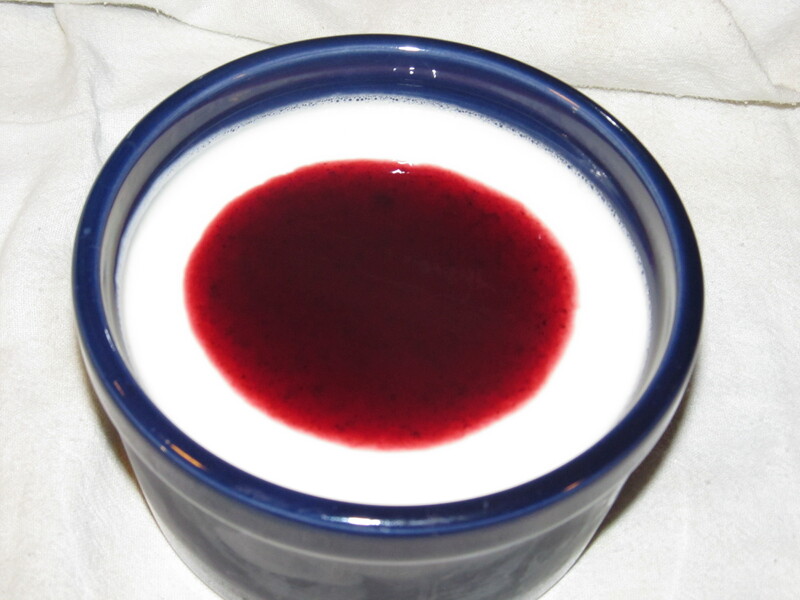 This entry was posted in activities, DIY, Life's Simple Pleasures, Recipe and tagged almond, almond milk, beautiful, blackberry syrup, cream, creamy, dessert, easy, fruit, honey, Milk, Panna Cotta, quick, smooth, unflavored gelatin. Bookmark the permalink.